Andy Robertson is the new Scotland captain. 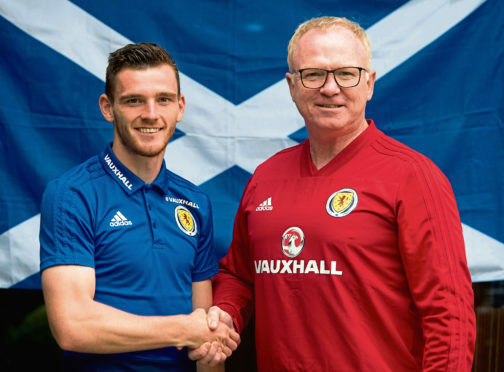 New Scotland captain Andy Robertson will be far removed from his only previous captaincy experience when he leads his country out for the first time in tonight’s friendly against Belgium. Liverpool defender Robertson was earlier this week confirmed by Scotland boss Alex McLeish as the permanent successor to previous skipper Scott Brown, who retired from international football in February. Although Robertson is firmly established in Jurgen Klopp’s Liverpool side, and was an impressive performer in the Reds’ Champions League final defeat to Real Madrid in May, being handed the armband will come as a relatively new experience for the 24-year-old. Robertson has only skippered a team once from the start, for Dundee United in a 2-2 pre-season friendly against Forfar Athletic at Station Park in July 2014. It proved to be Robertson’s final appearance for the Tangerines, before he joined Hull City in a £2.85 million move. Robertson is relishing having began his senior career at Hampden with Queen’s Park. He said: “It is a new thing for me. Just before I left Dundee United I captained them for one game, although I think that was maybe to keep me there. “It was a pre-season friendly against Forfar – I managed to score and get an assist so it was quite a good day for me. “Although it ended up being my last game for United. I do remember it, when the gaffer told me I was going to lead them out. “Other than that, when Charlie Mulgrew went off against Costa Rica I think I captained the team for the last 15 minutes. So I have had little experience but I am still young enough that I can grow into the role, given a bit of time I feel I can be a good one. Although Hampden Park will be far from full tonight, the visit of Belgium is sure to bring back memories for Robertson. Whilst working in a part-time role for the Scottish FA during his stint with amateur side Queen’s Park, Robertson handed a match programme to former Red Devils skipper Vincent Kompany ahead of a World Cup qualifying match in 2012. Robertson has enjoyed a meteoric rise since, but he resists the urge to reflect on how far he has come, adding: “I couldn’t have pictured this when I was at Queen’s Park. “But I think the stage of pinching myself is behind me now. When I moved to Hull and I was playing against these players in the Premier League maybe I pinched myself then. “But now I am at a very big club, I have been there a year and I have settled into it.